Many of those who have dug for thundereggs at the Colorado Desert’s famous Hauser Geode Beds or Potato Patch are also aware of the existence of the nearby Cinnamon Beds. Perhaps someone mentioned the name, or they may have seen it on a map. They may even have wished to dig there. Many, probably most, such rockhounds have not attempted to do so because they have not known just where to look for the dig. One lady who had spent an unproductive day searching for the various different geode beds complained to me that she had not been able to find any markers anywhere. Had someone stolen them? She had driven throughout the region looking for road signs! With the advent of relatively inexpensive GPS readers, though, pinpointing a location no longer poses much of a problem. Like geodes and nodules from other nearby sources, those from the Cinnamon Beds sometimes are found in volcanic ash that underlies desert pavement. Many, though, must be carefully and laboriously pried loose from their matrix of fractured rhyolitejust like many others. Despite such similarities, there are several differences, some of which are significant. Geodes from the Cinnamon Beds tend to be larger, their interior cavities generally are more spacious, and the ratio of geodes to nodules is much greater than at the Hauser Beds or the Potato Patch. Moreover, the interiors of the geodes often contain anywhere from a few little specks to a full coating of rich, cinnamon-brown colored quartz druse, making them distinctive and giving the site its name. They sometimes contain rather spectacular black calcite crystals as well. While such differences may sound good, there are drawbacks. 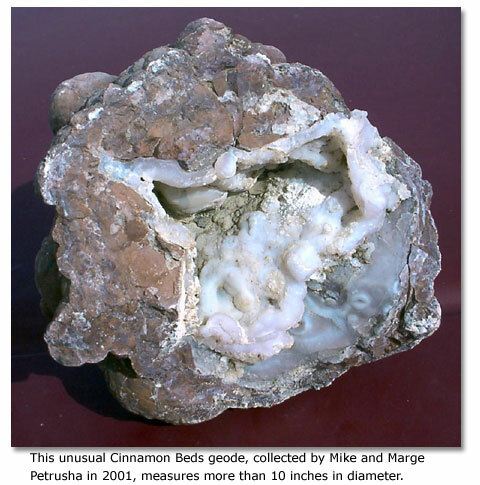 Geodes from the Cinnamon Beds tend to be more fragile than those available at nearby digs; larger ones often are so easily fractured that it almost seems that they break open of their own weight. Moreover, their interiors tend to be rather plain looking compared with those from other nearby sources. The crust of druse can be very thin. Although the cavities usually offer more than enough room, do not anticipate finding large quartz crystals in them. Do not expect the cavities to be surrounded by spectacular banded agate, either. A significant number of these geodes have cavities that are only partially lined. A few contain nothing but air, and the surrounding rhyolite may hardly be worth a second look. Although they can be quite beautiful, these geodes are sought mainly for their uniqueness. They can be spectacular in their own way, though. Cinnamon Beds geodes range in size from less than two to more than ten inches in diameter. I once saw one that must have measured sixteen inches across outside, with a twelve-inch cavity. Those geodes with a combination of a large cavity lined with brown quartz druse, and containing only one or two large, jet-black calcite crystals, can be striking and well worth the time and effort required to locate and extract. While it is not known exactly when the Cinnamon Beds were discovered or who should receive credit for the accomplishment, it doubtless ranks as one of the many results of Joel Hauser’s 1937 discovery of the nearby geode beds that bear his name today. Prior to that event, rockhounds simply searched for geodes and nodules that were in plain sight on the surface of the ground. The discovery of the Hauser Beds brought a change in methods because it showed that there were far more thundereggs underground than there were on the surface. The surest way to obtain them appeared to be to dig them out of beds of volcanic ash or rhyolite. It seems reasonable to assume that some enterprising rockhound who had learned of the value of digging discovered the Cinnamon Beds in the years following Hauser’s breakthrough. 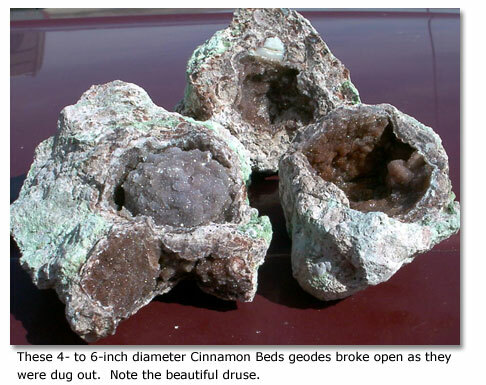 In any event, by the 1950s rockhounds were digging geodes and nodules at the Cinnamon Beds. The geodes are not especially difficult to find, but the digging can be fairly strenuous. Moreover, attempting to secure the release of a larger one from its surrounding rhyolite or solidly packed ash can be tedious and very time consuming. Look for places were other rockhounds have dug in the past. Some of the best digs are located on the west side of the hills, so watch for trails that lead in that direction. A vehicle with four-wheel drive and high clearance can be helpful, but is not essential. A careful motorist can drive to within one or two hundred yards of what recently has been the most productive area as long as their vehicle has reasonable ground clearance. One nice feature about the Cinnamon Geode Beds is that they are close to other collecting sites. The Potato Patch is only a third of a mile south, and the middle and northern sections of the even better known Hauser Geode Beds are less than an air mile southwest. 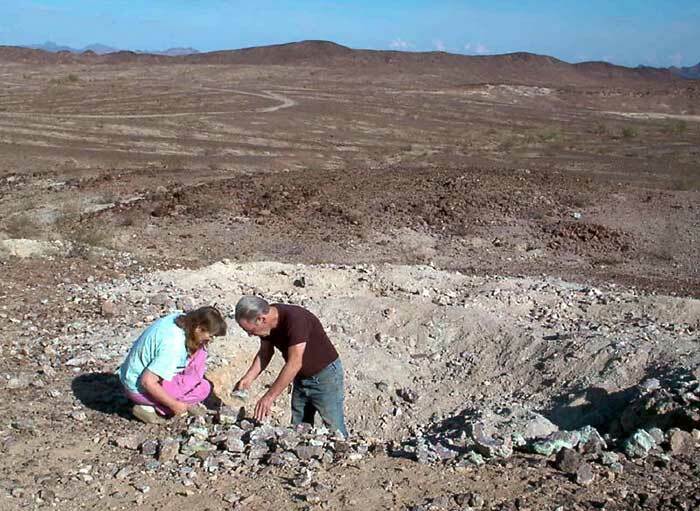 To reach the Cinnamon Geode Beds, located approximately 16 miles west of Blythe, California, take the Wiley’s Well exit from Interstate Highway 10. Drive 2.9 miles to a stop sign. The paved road turns right toward two state prisons, but you will need to drive southward another 10.4 miles to the Riverside-Imperial county line at 33°25.800' N and 114°54.180' W.
Wiley’s Well Road becomes Milpitas Wash Road in Imperial County, though there may not be a sign to indicate the name change. On the other hand, you should see a sign indicating that the Hauser Geode Beds are to the west. It was erected in early 2000 by the California Federation of Mineralogical Societies. Follow the directions on the sign and, immediately south of the county line, at 33°25.794' N by 114°54.182' W, turn right onto the track that angles southwest across the desert pavement. This will lead you slightly more than a half mile to what is generally known as the Black Hills Road at 33°25.429' N and 114°54.620' W. Bear right, and continue on the most traveled road past a metal signpost marked “Ashley Flats” straight ahead and “Gerdes Trail” to the north. Continue driving in a generally westerly direction to a second metal signpost, this time marked only “Ashley Flats,” at a fork in the road. Your GPS coordinates should be close to 33°24.825' N and 114°58.145' W. Located about 4.5 miles from Milpitas Wash Road (or Wiley’s Well Road), this junction marks the approximate center of Middle Camp. To continue toward the Cinnamon Geode Beds take the south fork and cross the gravel bed of the Black Hills Wash. In one mile you will reach another junction, at 33°24.121' N and 114°58.679' W. This one, known as Potato Patch Junction, is unmarked. One short stretch of road just before you reach the intersection is rough, but if you pick your course carefully and take it slow and easy, you should have no trouble. At Potato Patch Junction turn right and cross a little wash. In approximately three-fourths of a mile, at 33°23.713' N by 114°59.262' W, the road dead ends at a point called Nodule Junction, where another road crosses at right angles. Turn left and drive southward three tenths of a mile. There, at 33°23.556' N by 114°59.039' W, you should be able to see tracks going off to the right. Follow those tracks. As you drive past a low knoll on your right you should be able to see a very extensively dug area to the north. It marks one of the more productive parts of the Cinnamon Beds. If you do not have four-wheel drive, park here, rather than attempting to drive over the tilted bit of road ahead. Although it may appear firm enough, two-wheel-drive vehicles can easily lose traction and get stuck. 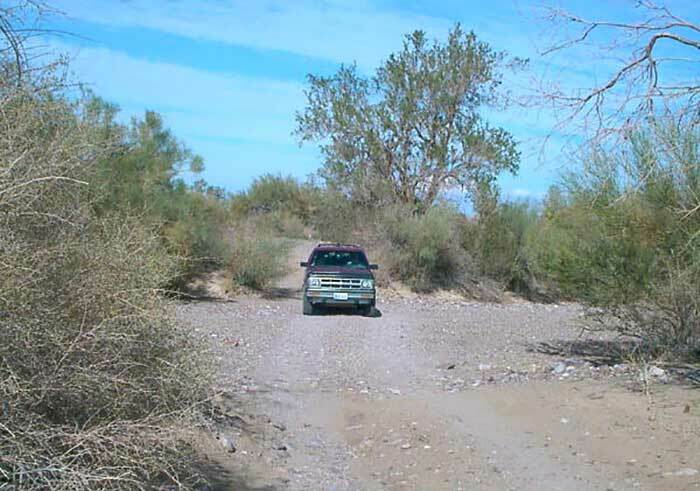 The road ends at a drop-off in less than one-tenth of a mile, with evidence of previous digging on both sides. If you did not park your vehicle just west of the last junction, park at the end of the road, at 33°23.477' N by 114°59.061' W, and take the little foot path that leads southward, then westward, around a knoll. Behind that knoll, at 33°23.460' N by 114°59.044' W, is the spot where the largest and best of the Cinnamon Beds geodes were dug out from about 1996 to early 2003. In fact, the digging was so productive that during the winter of 1999-2000 a small group of men drove a two-ton truck in and, with a show of firearms, for several days tried to dissuade any interlopers until they had it loaded and left. The unfriendly diggers appear to have accomplished their goalwhatever it may have been. Dig there, or find a different spot  previously dug or not  anywhere from approximately two-tenths of a mile north to an equal distance south. The southern edge of the Cinnamon Beds offers some particularly nice white jasper. A small percentage is fine-grained enough to be classed as pastelite, of interest to flint knappers. Some is almost snow white, some has greenish inclusions, and some has small black inclusions. It makes nice cabs. Because summertime temperatures often reach 115° Fahrenheit in the shade, and there is precious little shade available, the best time to visit the Cinnamon Beds is from late October to late March. Be sure to take plenty of water and whatever else you may need. Accommodations, services and supplies are available in Blythe, 30 miles northeast. There are hotels and motels in Blythe, with something for every taste and price range. For more information and a complete list, click here for rates, availability and reservations online. Want more places you can find geodes? Click here. If you don't have time to look, click here.